Electric currents and electromagnetic fields have been applied to biological systems, particularly humans, with both therapeutic and pathological results. Applied Bioelectricity discusses biological responses to electric currents and electromagnetic fields, including medical applications and shock hazards. 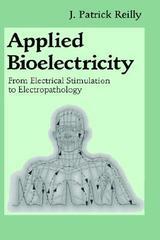 This book is a revised and expanded version of Reilly's 1992 book, Electrical Stimulation and Electropathology. Applied Bioelectricity covers fundamental physical and engineering principles of responses to short-term electrical exposure and emphasizes human reactions, although animal responses to electricity are considered as well. The treatment covers reactions from the just-detectable to the clearly detrimental. An important new chapter discusses standards for human exposure to electromagnetic fields and electric current and demonstrates how these standards have been developed based on the principles treated in earlier chapters. J. Patrick Reilly is a member of the principal staff of the Johns Hopkins University Applied Physics Laboratory and is President of Metatec Associates. Introduction.- Impedance and Current Distribution.- Electrical Principles of Nerve and Muscle Function.- Excitation Models.- Electrical Properties of the Heart.- Cardiac Sensitivity to Electrical Stimulation.- Sensory Responses to Electrical Stimulation.- Skeletal Muscle Response to Electrical Stimulation.- Stimulation via Electric and Magnetic Fields.- High-Voltage and High-Current Injuries.- Standards and Rationale.